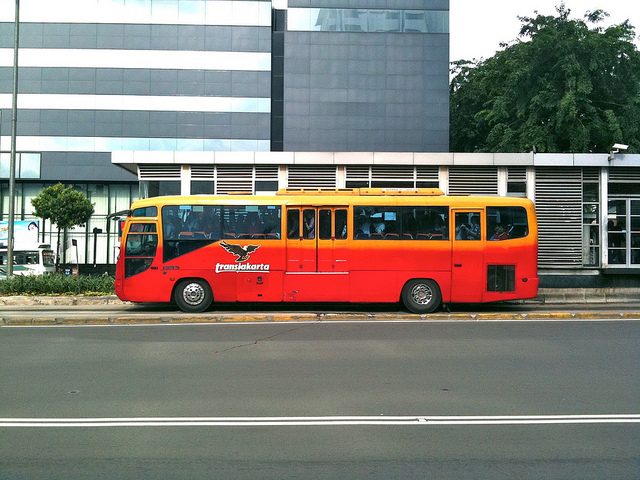 Jakarta, Indonesia's bus rapid transit system, TransJakarta, is the city's most advanced form of public transport. Photo by Charles Wiriawan. Although Indonesia may still be accepting private vehicle imports, the citizens have spoken loud and clear: more car free days! Similar to Bogotá, Colombia’s Ciclovia or Minneapolis, Minnesota’s Open Streets, Jakarta’s Car Free Day, first conducted once a month, has gained so much positive attention that the city government is considering implementing it every week. Encouraging individuals to leave their cars at home, Jakarta’s Car Free Day opens the city streets to pedestrians and bicyclists, with only vehicular traffic being TransJakarta. And although Jakarta citizens are excited about Car Free Days and the success of TransJakarta, Governor Fauzi Bowo’s administration has received poor ratings in dealing with traffic congestion. According to the Jakarta Post, only 29.4 percent of respondents thought that the Governor had performed well in providing decent public transportation. Despite Governor Bowo’s positive contributions to TransJakarta, like calling for improvements in driver recruitment and installing tracking devices in vehicles, 70 percent of the surveyed group still think that the Governor has failed in managing traffic. Road construction and its effects on traffic may be part of the problem. Jakarta had initiated two construction projects on elevated roads back in January. Jakarta’s Traffic Police and Public Works had predicted that these construction projects would have a negative impact on the city’s already congested traffic at least until September 2011. Although the construction takes place between 10pm and 5am, the blocked lanes of construction have taken a toll on traffic. Part of this construction is to provide a platform for the city’s ongoing Mass Rapid Transit System (MRT) project. The MRT will be a rail-based transport system that services over 110.3 km (68.5 miles) of Jakarta’s roads. The administration is relying heavily on the MRT to solve Jakarta’s congestion problems. With 7.34 million private vehicles in Jakarta today and a 9.5 percent growth rate in vehicular traffic in the past five years, public transportation does not seem to be a popular mode of transport. But even though public transport makes up only 2 percent of all trips, these services benefit 56 percent of all trips in Jakarta. According to Tony Ibanez from Harvard University, a professor of urban planning and public policy, TransJakarta alone is capable in reducing private vehicle traffic. In fact, he encourages the city government to focus in developing BRT-based public transport schemes. “Each bus can accommodate 80-90 percent of passengers, more routes and lanes of TransJakarta bus must be built to serve the citizens,” Ibanez explained.